2016 saw the rise of many new trends in the food and catering industry. Gluten free took restaurants by storm, forcing many to adapt their menus, whilst the UK Government and health groups focused on reducing sugar intake. ‘Brexit’ continues to cause wide-spread uncertainty among employers regarding staffing and the future of importing and exporting produce. Speakeasy bars have been popping up left, right and centre and brunch is on the up and up. So what’s in store for 2017? Many trends that have evolved over the last year are reaching their prime as we enter 2017. Healthy eating is a rising trend, although critics say it’s here to stay. The number of vegans in Britain has increased by a whopping 360% over the last decade and vegetarians account for an estimated 5.7% of the UK population (over 3 million). So why is the choice to stop eating meat becoming so popular? And what does it mean for you? This article will show you how to profit from a vegetarian menu with ease. 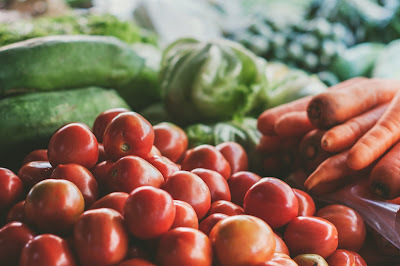 One of the reasons for the sharp rise in vegetarianism and veganism relates to growing concerns over how the production of meat is causing damage to our planet. A new moral compass means customers, especially Millennials and Gen Zers, are wary about where their food comes from and how it’s produced. This means more customers will be searching for meat-free dishes to satisfy rumbling stomachs. Adding vegetarian and vegan options to your menu will help you appeal to a growing market. It also ensures you can still appeal to large groups that want a variety of dishes. Why not introduce a ‘meat free Monday’ theme? This will help you fill tables on quiet Mondays whilst also targeting the vegetarian market. Another option is to always feature a meat free option on your specials board. Love it or hate it, technology is playing a bigger part in the dining out experience than ever. From fast food kiosks to iPads at your table, the use of tablets, machines, phones and apps to order food is a growing trend. 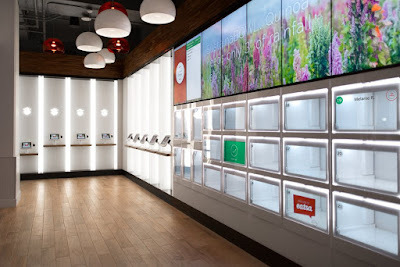 Fast food giant McDonalds have been using self-service kiosks at their restaurants for some time now. Speeding up the ordering process, they allow customers to customise their orders with ease, simply tapping the screen, paying and picking it up from the counter. Not only does it make the whole ordering process quicker and easier for customers, but it helps them to save on staffing costs. Could we see fine-dining restaurants going this way too? The first fully automated restaurant chain opened in 2016, so we could see this becoming more popular. Speed up or simplify ordering by allowing customers to pre-order their meals on apps or on a device at their table. Or give children something to do whilst they wait for their food with games on tablets. The opportunities to blend technology into your business are staggering and seemingly endless. Drones are becoming an idea many restaurants and other companies are toying with. Just imagine delivering your customers’ order by drone! What’s 3D food printing and how does it work? The times people are eating meals is shifting. Breakfast is no longer resigned to quick early morning snacks. The all-day, whatever-you-want, whenever-you-want, breakfast culture has taken root and growing fast. The trend is developing around weekends, as customers merge breakfast with socialising. Groups are heading out to satisfy their mid-morning munchies on weekends more than ever, and this is creating a massive market for all-day breakfasts and more exciting menus. So what can you do? Want to create the perfect menu? Find out how with our guide on how to write a restaurant menu. Extending your breakfast menu or adapting it to suit groups of people is an easy way of capitalising on the brunch boom. And you aren’t restricted to just food. Some restaurants and bars are offering a boozy brunch or bottomless milkshakes. Creating a unique and enticing breakfast offering is key to securing your venue as the place-to-be for brunch. With the brunch trend on the rise and breakfast becoming more and more popular, there’s a lot you can do as a restaurant, cafe and bar owner. Making the most of these trends in 2017 will help you boost footfall in quiet times and creating a breakfast buzz in your venue. Find out more with our guide to breakfast for 2017. Whether at the beach or strolling around town, Brits can’t resist an ice cream when the summer comes. But Mr Whippy has his work cut out this year, as crazy ice cream creations take centre stage. The standard ice cream in a cone is getting a makeover and the result is a mesmerising display of colour, sweets and size. These crazy creations tower over their 99p counterparts in both size and cost. But customers love them and they’re becoming more and more popular. To create your own ice cream monstrosity, think big! Stack it high with ice cream, add lots of different toppings and make them customisable, so customers can create their very own ice cream dream. And then there are the freakshakes. Appropriately named to represent the size, appearance and probably calorie count! 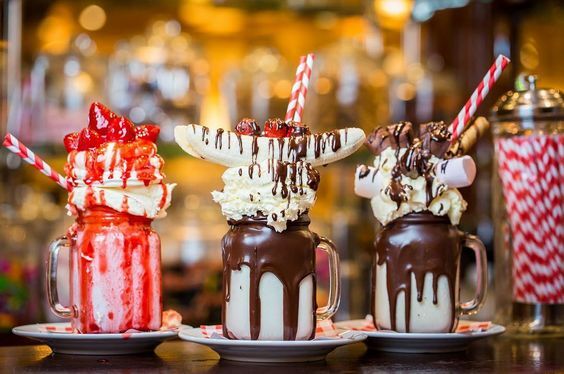 We imagine freakshakes came to be in a way similar to Frankenstein’s monster. A little bit of this, a little bit of that, and a whole lot of sugar. Sweet tooth or not, these trends are set to reach their peak in 2017, so now is the time to prepare. You can add these to your menu year-round as desserts or just for the summer to entice sweet-toothed sunbathers. Add a pick ‘n’ mix area to your venue and let customer pick the sweets they want, then your waiting staff can take the sweets to the kitchen for your chefs to prepare. This gives your customers a personalised dessert that they really want. And as the combinations are endless, they’ll be back for more. You can also make them more appealing to adults by adding alcohol to the mix, perfect for sharing! Ever wondered what it was like during prohibition in America? Well your customers have, and the demand for speakeasy style bars is becoming too great for business owners to ignore. Some of the most popular and successful bars in major cities are styled around prohibition-era bars, with a ‘secret’ entrance and retro interior styling. The menu is also themed with gin and whisky. The whole atmosphere is designed to create an experience, rather than just a place to drink. People can imagine and feel as though they are being a little naughty and cops might come bursting through the doors at any moment. Do you know which glass is best for cocktails? Find out here to make the perfect cocktail every time. Converting your venue into a speakeasy bar might not be that easy. Removing all signage, boarding up your windows and having a password might seem a step too far, but if you’re looking to jump on the trend there is lots you can do. Many speakeasies have no sign, no bright lights and can even look abandoned from the outside. It’s all about the inside. Bring back the retro style of the 19th century with candles, retro furniture and a menu that reinvents the prohibition cocktails. Which trend are you looking out for this year? Is there a trend you’re most excited about that’s not on our list? Let us know in the comments!